Sandwalk: Everything Is There for a Reason? Everything Is There for a Reason? Nils Reinton of The Sciphu Weblog has just posted an article entitled Junk, DNA, RNA, Brain, Biology and Possible Solutions. Instead, let’s start by acknowledging that we know very little. All we know is that function comes out of an apparent chaotic mixture of DNA protein and RNA. Let’s assume that everything is there for a reason. Without reason you loose hope and visions and those are qualities that science is vitally dependent upon. This statement combines two of my pet peeves. First, our use of the term "junk" DNA is not based on ignorance in spite of what Nils implies. We know, for example, that 50% of our genome consists of defective transposons. That looks like junk to me [Genomes & Junk DNA]. It makes me really, really annoyed when fellow scientists assume that junk DNA supporters are basing their entire argument on lack of knowledge about biology. Instead, it appears that the other side is the guilty party. Second, by explicitly stating that one should assume that everything is there for a reason, Nils is making the case for adaptationism. It's a weak case. Why should we assume, without evidence, that everything is an adaptation? Why not consider the possibility that it may have no function and proceed to investigate while keeping an open mind? [Adaptationomics] If becoming a pluralist makes you lose hope and visions then maybe you're in the wrong business. I wouldn't even begin to assume that "fellow scientists assume that junk DNA supporters are basing their entire argument on lack of knowledge about biology", on the contrary I assume that you base your conclusions on extensive knowledge. My problem with your approach is simply that it isn't very productive and I believe that, contrary to what you think, coining the term "junk" will keep researchers from investigating further. As a result we'll miss out on something because even though you believe I do not know much about junk, I have had my share on work on transposons and I strongly believe that many of them, together with pseudogenes and Alu elements will reveal hidden qualities serving as regulatory elements or giving rise to RNAs with some function, or even more exiting, - new and unknown functions. To find out, I think it is much better with a little hype to keep the interest going, - and a little hype, in the meaning "scientific speculation", will do no harm in this case. I also do not think it is fair to say that hypothesizing or speculating that something has function makes you an adaptionist. I wouldn't even begin to assume that "fellow scientists assume that junk DNA supporters are basing their entire argument on lack of knowledge about biology", on the contrary I assume that you base your conclusions on extensive knowledge. I'll take your word for it. You might want to consider rewording your posting, especially the part where you say, "Dismissing reasons for the obvious complexity using terms like “junk-DNA” is not going to get us anywhere. Instead, let’s start by acknowledging that we know very little." My problem with your approach is simply that it isn't very productive and I believe that, contrary to what you think, coining the term "junk" will keep researchers from investigating further. It doesn't seem to have stopped anyone so far. Practically every week there's a new paper published that claims to have proven that junk DNA has a function. More importantly, if I truly believe, based on scientific evidence, that the DNA is nonfunctional then why should I not be allowed to say it? As a result we'll miss out on something because even though you believe I do not know much about junk, I have had my share on work on transposons and I strongly believe that many of them, together with pseudogenes and Alu elements will reveal hidden qualities serving as regulatory elements or giving rise to RNAs with some function, or even more exiting, - new and unknown functions. To find out, I think it is much better with a little hype to keep the interest going, - and a little hype, in the meaning "scientific speculation", will do no harm in this case. Let me re-ask the question I asked above. If I think that the DNA is junk, am I supposed to keep my opinion to myself out of fear that other scientists would believe me and stop working on that DNA? That seems to be what you're implying. If I've got it wrong then please tell me what you are suggesting. I also do not think it is fair to say that hypothesizing or speculating that something has function makes you an adaptionist. Let’s assume that everything is there for a reason. Without reason you loose hope and visions and those are qualities that science is vitally dependent upon. That's not just "speculating" that something has a function, that's assuming that it has a function in the absences of evidence. What you're advocating is a stance that forbids anyone from hypothesizing that the DNA might be junk. It's called science by fiat. Let me remind you of Gould and Lewontin's critique of the adaptationist program. We fault the adaptationist programme for its failure to distinguish current utility from reasons for origin (male tyrannosaurs may have used their diminutive front legs to titillate female partners, but this will not explain why they got so small); for its unwillingness to consider alternatives to adaptive stories; for its reliance upon plausibility alone as a criterion for accepting speculative tales; and for its failure to consider adequately such competing themes as random fixation of alleles, production of non-adaptive structures by developmental correlation with selected features (allometry, pleiotropy, material compensation, mechanically forced correlation), the separability of adaptation and selection, multiple adaptive peaks, and current utility as an epiphenomenon of nonadaptive structures. We support darwin's own pluralistic approach to identifying the agents of evolutionary change. Practically every week there's a new paper published that claims to have proven that junk DNA has a function. Clearly, you aren't persuaded by any of these papers. This raises the issue of what kind of evidence it would take to convince you to reconsider the complete non-functionality of "junk-DNA". Is there any conceivable data that you would accept, or is this junk now and forever regardless of the data? The new data showing a 1 in 10 trillion transcription rate as detected by NextGen Sequencing could easily be due to transcriptional errors. The alternate “functional” hypothesis will require more experiments. 1. Fighting scientific speculation (on the possible function of "junk"-DNA) seems to me to be a defensive and unproductive approach to research. 2. I am not an "adaptionist". There are good reasons to speculate on possible function of "junk"-DNA/RNA, one of them being the extensive transcription from these regions (requiring energy, which all organisms try to save upon). You can dismiss this expression by saying they are "transcriptional errors", but that only underscores my first point. If the speculation isn't evidence-based, is it scientific? Again we're back at the point of whether there are in fact good (scientific) reasons to speculate. The reason you give - that transcription takes energy, which "all organisms try to save upon," reduces to "if energy is expended on creating it, there is probably a good reason for it." So why then is energy expended upon transcribing the genes that give me an appendix? And we're off searching for (speculating upon) reasons why an appendix would be beneficial. Do you see how such "reasoning" leads directly to adaptationism? I accept a great deal of the evidence that's published. For example, when a paper shows a specific example of some function for a segment of DNA that previously had no function it (the paper) is usually right. This does not mean that all junk DNA now has a function. There are several approachs that would convince me to change my mind. One of them involves deleting large segments of DNA that are supposed to be junk. So far all those experiments have failed to show any effect of such a deletion. If lots more experiments are done and most of them cause some sort of mutation then I'll have to revise my opinion. I'd also like to see someone come up with an explanation for why these DNA sequences accumulate variants at a rate that approximates the mutation rate. That's exactly what you would expect if the sequence was unimportant. Do you know about the Onion test? Ok Jud, let's use your appendix analogy: For arguments sake, say you couldn't see the appendix, but you could measure it's size. Similarly you knew the size (length ?) of functional intestinal tissue. Since we are discussing "junk" DNA, let's (again for the arguments sake) make the relative size of the appendix equal to the amount of junk-DNA in the genome compared to functional DNA. Then you go ahead and do your experiment and lo and behold, your measurements show that the appendix is just as big as the functional parts. Now, since half of the intestinal tissue is appendix, I would want to investigate further by speculating on possible function of the appendix. These are the proportions we are talking about when we are talking about "junk" DNA. In addition, there is extensive transcription from these stretches of DNA which I am unwilling to simply dismiss as "transcriptional errors". Therefore, I am willing to dive head-first into speculations on possible functions even though I run the risk of being misrepresented as an adaptionist. In addition, there is extensive transcription from these stretches of DNA which I am unwilling to simply dismiss as "transcriptional errors". Therefore, I am willing to dive head-first into speculations on possible functions even though I run the risk of being misrepresented as an adaptionist. Could you enlighten me on your speculations? Do your speculations also account for the abundant evidence in favor of "junk"? How do you dismiss that evidence? Do your speculations have to conform to our current understanding of biology or is it permissible to speculate on radical new ways of regulating genes? The word "reason" here is used in two different ways. In the first instance, explaining that there are causes to effects, and in the second referring to the logical analysis of a problem. I can't help but "theorize" why on earth the author would not think twice about using this tactic, because it is also frequently used to deceive, particularly by anti-evolutionists to question the "theory" of evolution. "Let's assume non-coding DNA has a purpose. Without the ability of our minds to conduct logical analysis, we lose hope." Pardon my language, but WTF do you mean? We see that the second phrase has no logical connection to the first phrase. We see that the original phrase now even sounds wooish. A second problem is the idea that we should assume that non-coding or junk dna may have a reason. On the face of it, there is no problem with this argument. Because logically, using the tools of science, we can either try to prove or disprove any theories towards proposed purposes of instances of non-protein-coding, non-regulatory DNA. But people are too adept at seeing purposes and patterns where none exist at all, and are frequently unaware of their bias for doing so. It is the keystone of the cathedral of ignorance, holding up intelligent design, astrology, much alternative medicine, and so on. And it happens, on occasion, in science too: for example, look at sonic fusion: Taleyarkhan, quite honestly (most likely), saw what he set out to find, but couldn't convince himself that evidence validating his theory so exquisitely could be explained by chance occurences in lab's setup. So, even absent the fact that observation and experiment show that junk DNA often has no function, and absent the fact that there are plausible theories of how junk DNA can come to be, persist, or even become lost, it is better, as a working assumption, that we stick with non-functional as an hypothesis, and try, if we have reason to, to prove it wrong in certain instances. crf. That was an excellent comment, thank you, - honestly. To your first point. I am sorry you did not like that sentence, -me, I thought it was rather clever, -couldn't fool you though :-). I am going to continue to use my "poetic licence"......but, not because I am aiming to deceive and especially not to argue against evolution. I cannot understand why anyone disagreeing with Larry Moran needs to be categorized as an anti-evolutionist or adaptationist, - using derogatory labels in this manner is much more damaging to the scientific debate than using ones "poetic licence". "But people are too adept at seeing purposes and patterns where none exist at all, and are frequently unaware of their bias for doing so". I am not seeing any purpose, - that would make me an adaptionist now wouldn't it, I am not seeing any particular pattern either. What I am seeing is a hell of a Iot of DNA, half of all the DNA we have, much of it transcribed, that I am being told has no function. It's just "junk". I find that counterproductive and uninspiring. I also cannot understand why that is such a provocative position to hold. Your comparison to intelligent design and astrology does not cut it. We know DNA and what it does, there's no faith or religion in that. What we are discussing is merely how much of the DNA is being used, - and which approach to use to find out. Call it junk and leave it at that contra investigating further (which involves hypothezsizing and speculating on possible functions). I am very aware of my bias and this is very important. I am biased towards possible function, - that was the reason for writing my post. If others share this bias they will be looking for possible function, which in my mind is a good thing, it hurts no one and may benefit many. "I cannot understand why anyone disagreeing with Larry Moran needs to be categorized as an anti-evolutionist or adaptationist, - using derogatory labels in this manner is much more damaging to the scientific debate than using ones "poetic licence". I wasn't implying that you were an anti-evolutionist, only pointing out (in a very sarcastic manner, for which I apologize if you found it hurtful) that what you wrote doesn't make sense and is using a discreditable rhetorical device in the exact same manner as found in the tracts of anti-evolutionists. It would be hypocritical to criticise anti-evolutionists for the confusing use of the double meaning of the word "theory", but not criticise a scientist for using the same device (on a different word). The irony that the person using the device was a biologist was too good to not point out, because you'd think they, of all scientists, ought to be vigilant about this. "Your comparison to intelligent design and astrology does not cut it. We know DNA and what it does, there's no faith or religion in that. What we are discussing is merely how much of the DNA is being used." I was not implying that what you're doing is pseudoscience, or comparable to astrology. I was making the limited point that astrology was once considered a science because the hypotheses formed for it were structured similarly to what inspires you about junk DNA -- that there is something there, and we should look for it. It wasn't because the people studying astrology were dumb or biased that they considered it a science, but because their hypothesis was dangerously formulated. Similary Taleyarkhan was non-biased, a real, consciencous scientist. But his hypothesis that 'something is there' led him astray. LM: There are several approachs that would convince me to change my mind. One of them involves deleting large segments of DNA that are supposed to be junk. So far all those experiments have failed to show any effect of such a deletion. The lack of phenotype found in, for example the deletion of large stretches of mouse "junk-DNA", is superficially persuasive until you remember the hundreds of mice created with inactivating deletions in highly conserved protein coding sequences that also have no apparent phenotype. Some of these genes when inactivated in humans confer hideous disease phenotypes (WRN - Werner syndrome), but when knocked out in mice have no detectable effect. Other genes (TERT - telomerase reverse transcriptase) also don't have any overt phenotype in the knockout animal either, unless combined with other mutations, or unless you wait seven generations, at which point all the mice die. The essential observation from deletion experiments is that biological systems are generally robust to genetic perturbation. LM: I'd also like to see someone come up with an explanation for why these DNA sequences accumulate variants at a rate that approximates the mutation rate. That's exactly what you would expect if the sequence was unimportant. This I don't understand... the "junk" accumulates variants at the mutation rate of... what? The bulk genome? 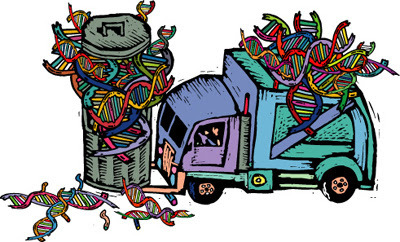 If 90%+ of the genome is "junk", then this is a statement that the junk accumulates mutations at the rate at which the junk mutates, which is uninteresting. If mutations are neutral (i.e., no effect on survival) then they will be fixed by random genetic drift. In that case, the overall rate of fixation of neutral alleles should be equal to the mutation rate (in mutations per nucleotide per generation). That's pretty much what we see when we look at the DNA in question. It's one of the most powerful bits of evidence of "junk." The other powerful bit of evidence is the genetic load argument advanced in the late 1960's. What this says is that if a large percentage of our DNA was functional, and we accumulate mutations at the rate of more than 100 per human generation (Mutation Rates) then we would not survive since each and every one of us would carry too many lethal mutations. "Looks like junk to me." One genome's junk may be another's regulatory regions. Arguments against junk DNA come in all sizes but in order for it to be a valid argument it has to make scientific sense. Are you saying that the amount of DNA required to regulate gene expression in some eukaryotes is almost 100 times the amount of DNA in the genes? This makes no sense whatsoever. We know a great deal about regulatory sequences and in all cases the sequences are quite small compared to the gene. Would you care to elaborate on your idea? How much energy does it really take to copy all that 'junk' DNA? How often does this process occur? I suspect that the amount of energy 'wasted' by a cell transcribing 'junk DNA' - even if totally useless - is substantially less than the energy required by cells on a daily basis just to run their sodium/potassium pumps. If one is going to argue about efficiency and energy use, one should beter spend their time wondering why cells are so inefficiant at controlling movement across their membranes. At any rate, I liked some of the vadlo mouse cartoons!